Make this season your best yet! Our Precision Planting team at Monroe Tractor is ready to assist in all planter upgrades. Click on the brochures below for more information on each upgrade, and then contact one of our Precision Specialists to schedule your service! 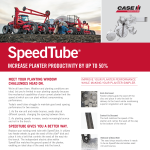 Increase planter productivity by up to 50% by replacing your seed tube with SpeedTube, with an electric drive that matches the ground speed of the planter. 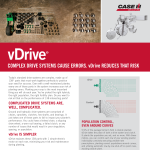 Take the complexity out of drive systems; replace over 130 parts with 1 simple electric motor on each row. Plus, take advantage of population control, even around corners. Maximize your yield by placing the right seeds in the right place. 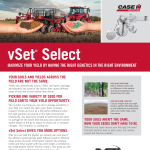 vSet Select allows seeds to be switched on the go, row-by-row. 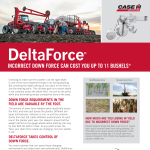 Incorrect down force can cost up to 11 bushels per season, so allow your planter to sense the changing environments and adjust each row automatically.